Includes one plastic oversized clown hammer. 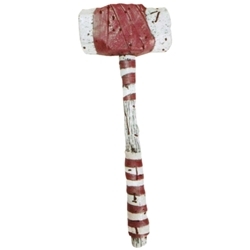 The hammer measures 24" in length and is white with red wrappings and blood spatter painted on. The bloody clown hammer prop weapon can be used for a number of different scary and spooky characters including murdering clowns, maiming mimes, and super villains.